Single Wall Corrugated Cardboard Boxes are robust and are ideal for packing goods to be transported by road, rail, or air. Supplied flat packed for convenient storage and easy assembly. Just use tape to seal up the bottom and top flaps. 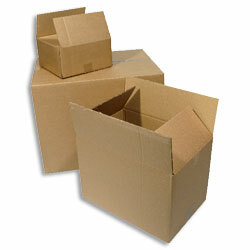 Manufactured from 100% degradable and recyclable high quality fluted corrugated board. 125K/B/T. 125gsm Kraft outer with a single wall B profile flute and a fully recycled Test inner. Box measurements shown in product description are internal and are L x W x H. All single wall boxes are made to FEFCO style 0201.